A long day today. Bizarre to be typing this from The Office, over looking the river, after midnight and the sun climbing up over the pine trees on the far bank. The builders boogie blaster now replaced by a cuckoo – both very repetitive! I’ll keep this brief and tomorrow will have a day here in Lower Camp to catch up and try and send you a bit more about the fishing and conditions. 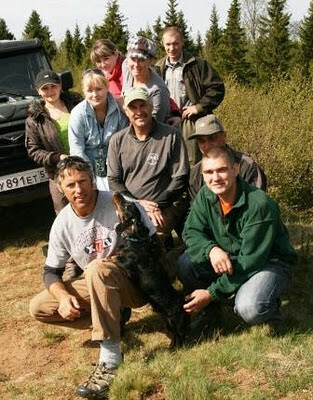 I took the crew up to Pana today, we picked up the Russian staff on the village heli pad; great to see the same team back with Head guide Dima and wife Elisa, Misha, Sergei, and float trip expert Denis. Kate was thrilled to see them and also Little Dave, the new Pana camp dog , not to be confused with Our Dave, mechanic and guide. The camp looked in good order, odd to see green grass this time of year. The river too looked perfect and I took a shot of Hippo Rock (below) as I know you Pana fishers want to see the water level. Dave and camp manager Aaron Ford will be busy the next few days setting up, but I have no doubt they will want to test the fishing as soon as they get time, I’ll let you know how they get on. This evening Keith and I went up to Middle Camp to see how they were and to do some work on the boats. An easy run up there and still plenty of water, not a lot of fish showing and that was rather the feeling from the guys at Middle. A tougher day, I suspect they will be in the 70 – 80 range, they had 96 in the book yesterday. That was echoed down here at Lower where they had 21. I failed to report last night that Lawrence T landed his first salmon yesterday, he continued his success today including this good one from Bear Island (below). Kitza reported 28, again from both below and above camp. It seemed a reasonable fishing day, a bit bright maybe, but warm and soft, a strong upstream wind made it tricky in places. I thought we would do better, but the water is still quite high and very warm at 10°C, I suspect the fish are not holding as well as they would normally this time of year when the temperatures are a good deal cooler. 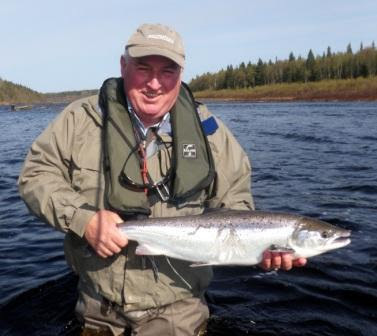 Message for Sandy – Mike had a great day and got two really good fish from Party Pool this afternoon at Middle Camp. (He was in good form, really pleased with the two fish in the ‘teens, we thought this form of communication might amuse you!). More on the fishing tomorrow.